Your eye and brain are programmed to look for meaning everywhere, so even a very few items can carry a message. The first road sign made by the first human may have been a cairn like this, a pile of stones that says "Here is the path." The bits that make the message can be anything: pebbles, stitches, chopsticks, Corn Cobs, people, pixels. We can call them mosaics, rasters, grids, arrays. They add up to beautiful, inventive letters that have a Special Place in American lettering. They spring from the attitude that declares, "Let's get a committee together and everyone can contribute." Letters that are made by a group have a special place in American life; crowdsourcing is in our DNA. When you arrange small items into larger images, you get to enjoy making lots of artistic choices about color, scale, and texture. One of the most important decisions is whether to allow the contours of the individual bits to determine how they are arranged, or to force them to conform to a regular grid. 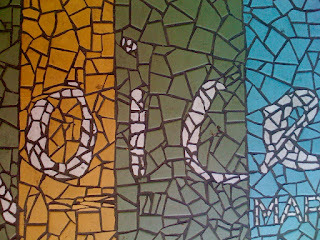 These mosaic letters are irregular, or "crazy quilt." These quilt letters are like pixels on a square grid. And here is a third, hybrid approach. ground tiles conform to a square grid. I hope you'll start looking at the many kinds of dots that form the letters you read, both onscreen and in the real world. Ask yourself: What makes them calligraphy? What makes them American?